It's Memorial Day weekend and if you find yourself at the mall, here's a suggestion for Lost fans. Go to your local GUESS store, and check out the men's clearance sales rack for tee shirts. 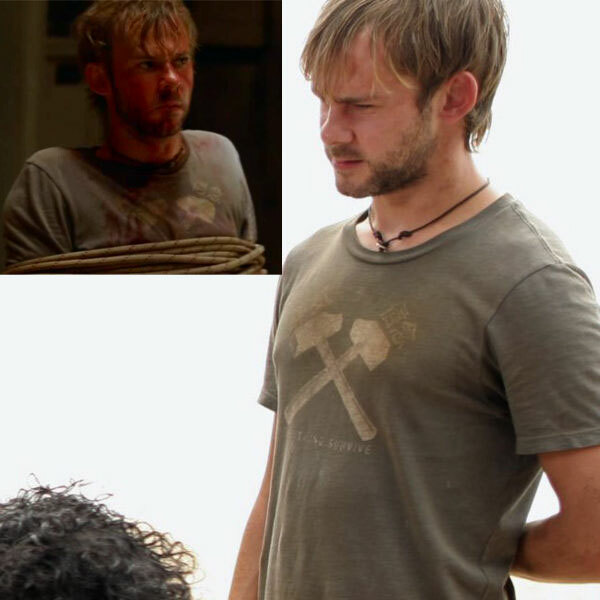 Among the shirts you may find the very shirt that Charlie was wearing the last few episodes of Season 3, and the shirt he was wearing when he met his fate in the finale (Through the Looking Glass) at the blinking yellow light. Yes, it's a current 2007 Guess Jeans tee shirt: it reads "The Strong Survive", and features a weathered double-hammer graphic with some Chinese characters. The one in the store I visited was marked down to $11.99, and they came in several alternate colors. Go celebrate your inner Lost geek and buy one today. UPDATE: Specifically it's a "Guess Jeans" Men's "Vintage 1981" line Tee from 2007, MSRP $29.00. The specific color used in Lost is "Durango Grey". The tag reads: DUG A7, as well as M64DX391 and US MN. The UPC bar code is 6 05576 56649 5. It's a fitted tee, so its sizing is that of regular men's shirts, a size smaller than Tees. If you're a "L" in tees, you'd probably be a "M" in this one. Who Is this Man Behind the Curtain? I left my transceiver in San Fransisco...? Charlie: "The French are coming!"